Largest offering of Kerrisons on the market spanning the standard 40D UP 7" to the 40d UP 12" available in stainless finish, the proprietary Cer-Coat™ ceramic finish or the Sharp-Coat™ finish. 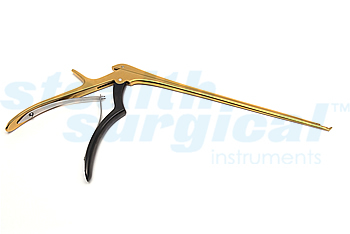 Additionally we carry all the ancillary or niche kerrisons, including curved Foramenotomy Kerrisons, Ferris Smith, and a full line of Ejector Kerrisons in various sizes. Our full gamet includes standard lengths all the way up to the longer lengths for spine procedures.